Disconnect linkage, fuel & vacuum lines being careful to note correct placement. Step 1 Remove Clip A (Fig. 1); release link B at that point. 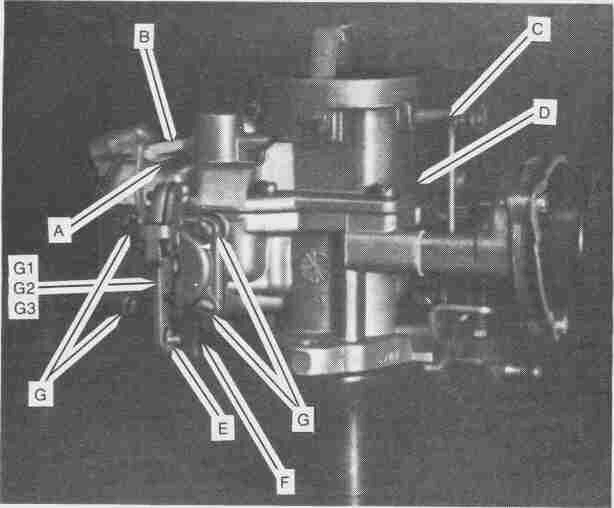 (On some models, this linkage is released by removing a screw at the lower end where it attaches to the fast idle cam). Step 2 Remove clip C (Fig. 1); release link D at that point. Step 4 Remove 4 screws G (Fig. 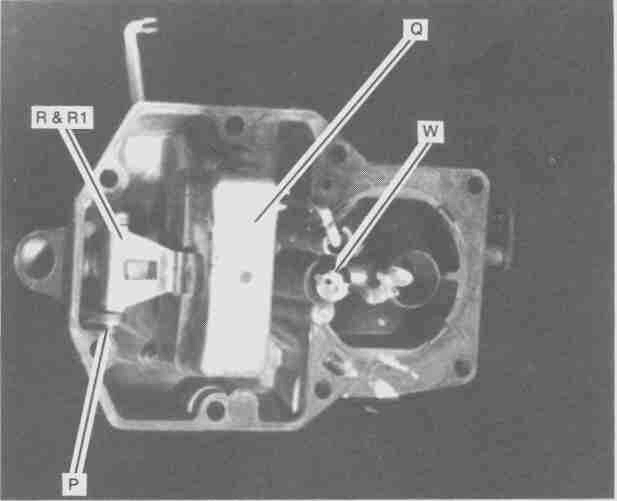 1); Lift off dash-pot cover G1 and remove diaphragm G2 and spring G3 from well G4 . Place spring in bath. Discard diaphragm. 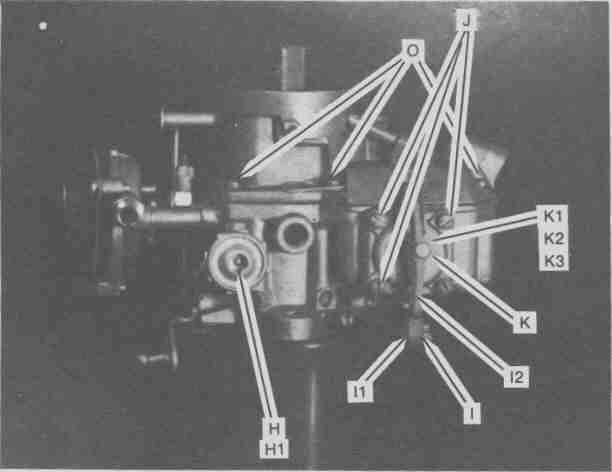 Step 5 Remove Power valve H (Fig 2) from well H1. Use crescent wrench or 1" open end wrench. 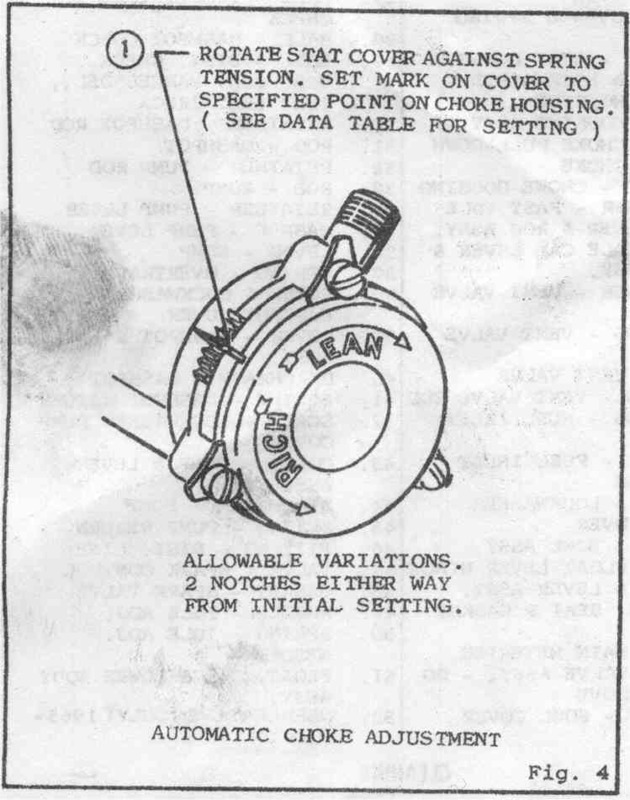 Discard valve. Step 6 Remove spring clip I (Fig 2) and release linkage I1 from lever I2. Step 7 Remove 4 screws J (Fig. 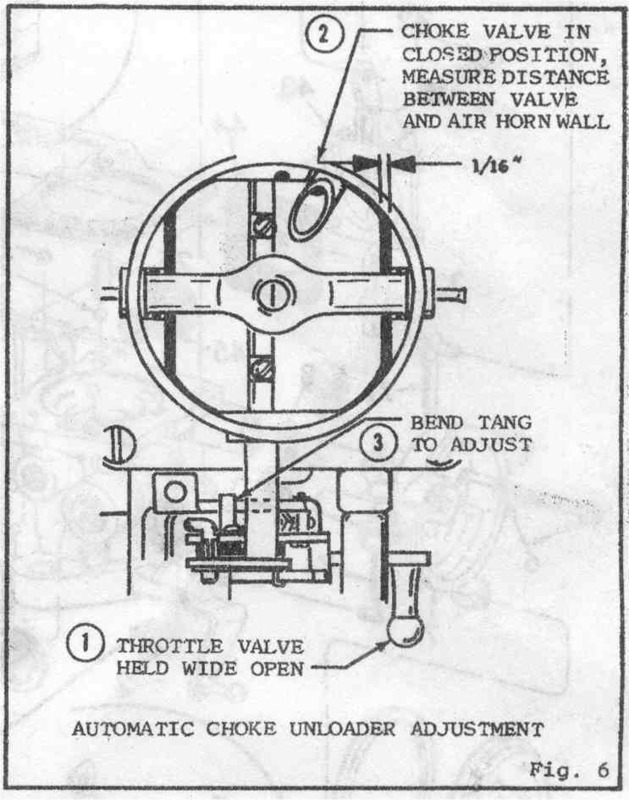 2); Lift off accelerator pump cover K and remove diaphragm K1 and spring K2 from well K3; Place spring in bath; Discard diaphragm. Step 8 Remove 3 screws L (Fig 2), retainer ring M, and choke housing N. Do NOT place in bath. Step 9 Remove 8 bowl cover screws O (Fig. 2); lift cover off carburetor bowl. Discard gasket. Step 10 Remove float hinge pin P (Fig. 3) and lift float Q. Do NOT place in bath. 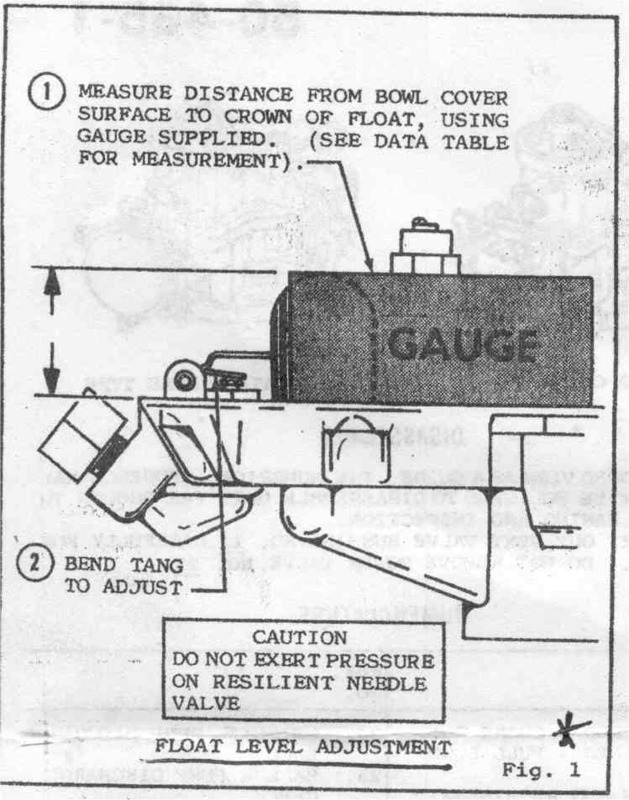 Step 11 Remove needle valve R (Fig. 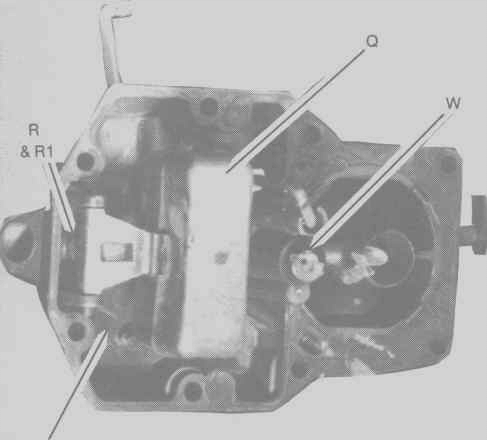 3) from seat R1; Discard valve. Step 12 Place bowl cover in bath. Step 13 Gently turn over carb your hand and allow balls S2 and S3 (Fig.4) to fall from wells S, S1 and weight T from well T1 to fall out. Discard the balls. Place weight T1 in bath. 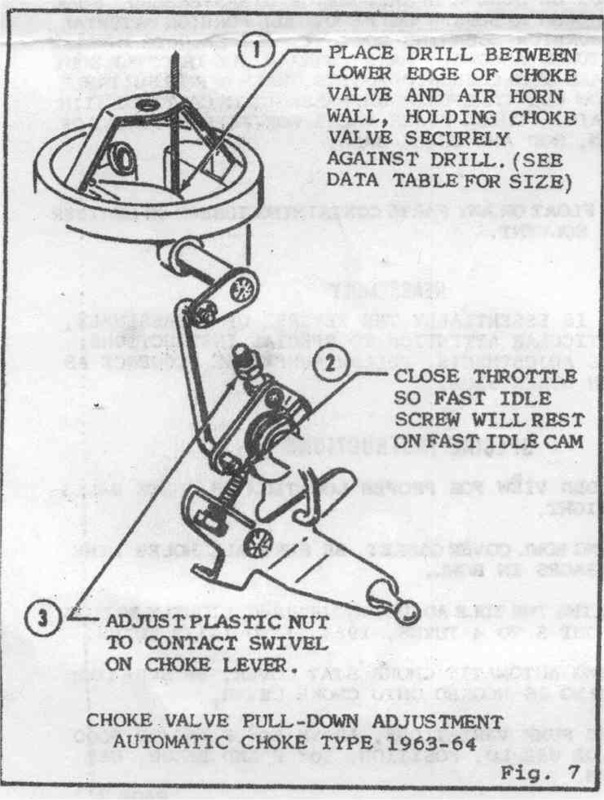 Step 14 Remove idle-mixture adjustment screw U (Fig. 4) and spring V; Place both in bath. Step 15 Place carburetor bowl in bath. Disassembly is now complete. Allow all parts to soak in bath for a while. Rinse all parts with clean water and allow them to air dry. Do NOT use compressed air. 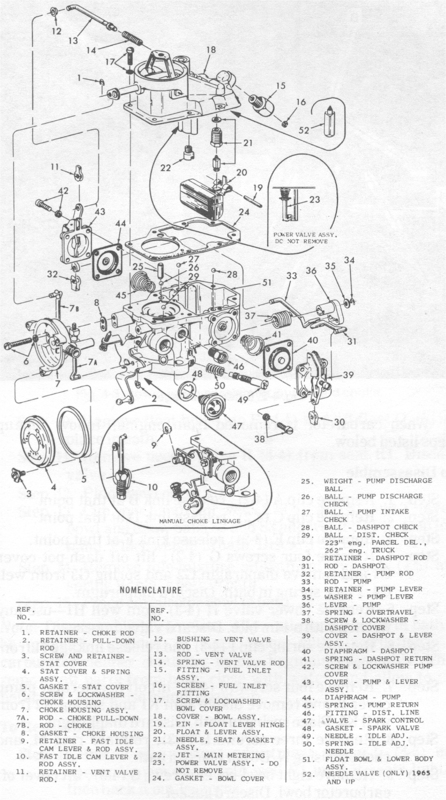 After parts are dry, proceed to step 16. Step 17 Drop new steel ball T2 (Fig. 4) into well T; Place weight T1 on top of ball. Step 18 Drop new steel balls S2 and S3 (Fig. 4) into wells S and S1. 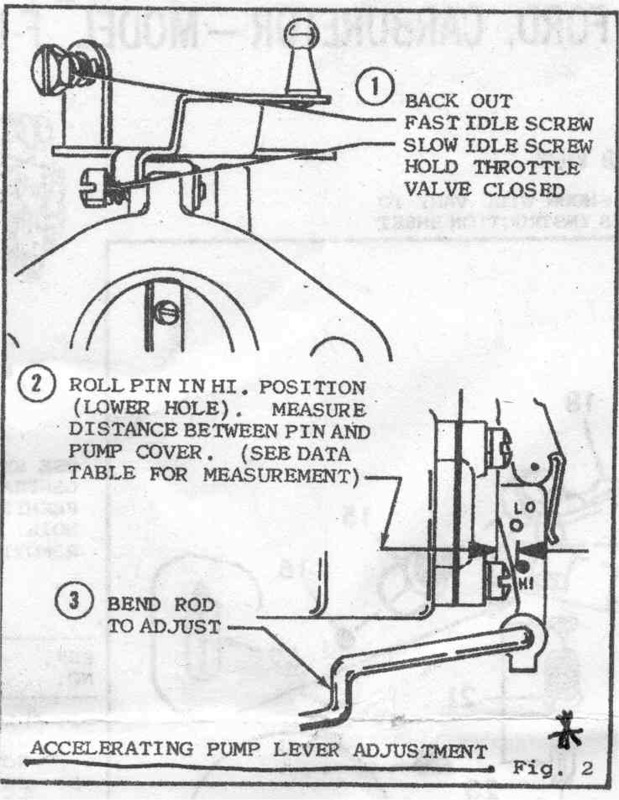 Step 19 Drop new needle valve R (Fig. 5), point first into seat R1. Step 20 Re-install float Q (Fig. 5) into bowl cover with hinge pin P.
Step 24 Lower bowl cover into position and carefully attach wth 8 screws O (Fig. 6). Tighten screws lightly and alternating sides/ends to ensure a tight fit and that no damage occurs to gasket. Step 25 Install new diaphragm K1 (Fig. 6) and tapered coil spring K2 into accelerator pump well K3. 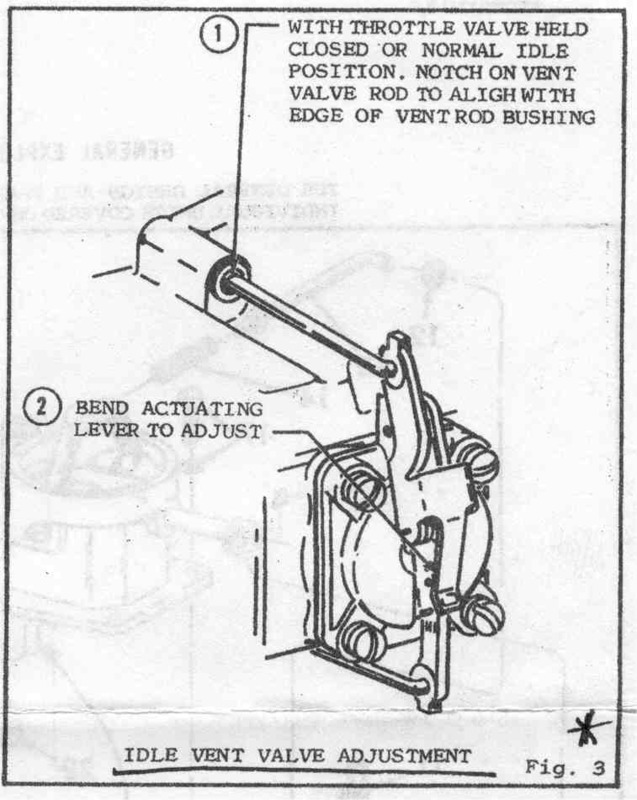 (Install spring point-first then place diaphragm over spring with "button" out). Step 26 Install acellerator pump cover K (Fig. 6) with 4 screws J. Ensure that screws are aligned with diaphragm; Tighten screws. Step 27 Attach linkage I1 (Fig. 6) to lever I2 with clip I. 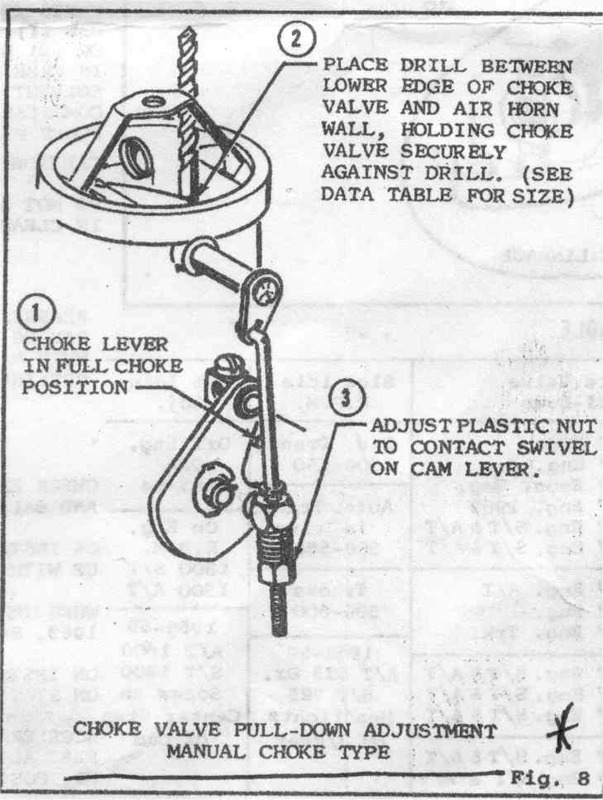 Step 28 Place new gasket on power valve (H) (Fig. 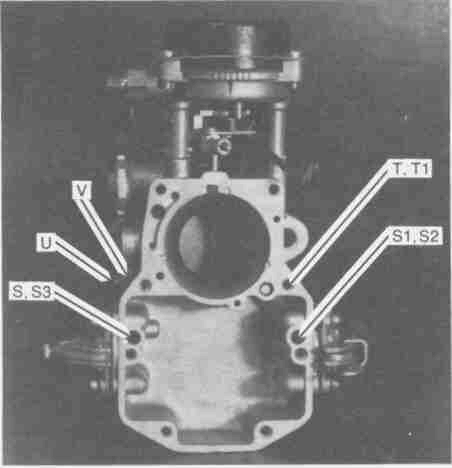 6) and thread in new power valve. Use 1" wrench or crescent wrench, being careful to not round faces. Step 29 Place new diaphragm G2 (Fig. 7), "button" side out, over big end of tapered spring G3, then insert both into dash-pot well G4, spring first. Step 30 Place dash-pot cover G1 (Fig. 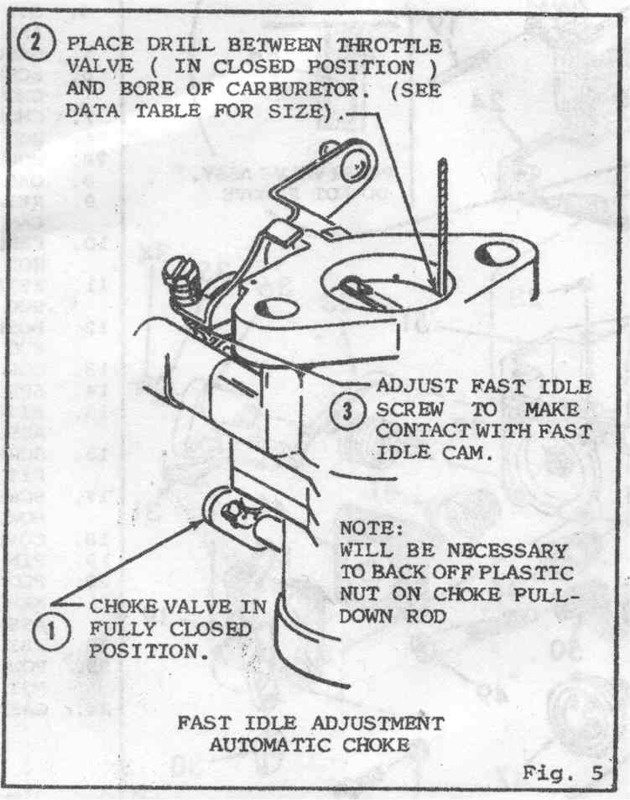 7) into position with lever hinge toward top of carburetor; install 4 metal screws G. Be sure screws are aligned with diaphragm; Tighten screws. Step 31 Attach linkage F (Fig 7) at point F1 with clip E.
Step 32 Attach linkage D (Fig. 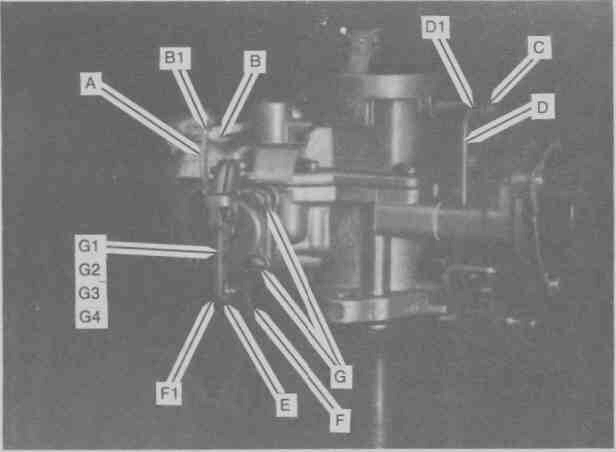 7) at point D1 with clip C.
Step 33 Attach linkage B (Fig. 7) at point B1 with clip A. 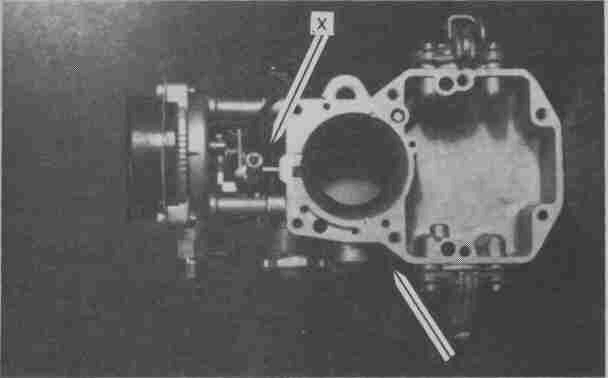 Step 34 Install carburetor on engine. Carefully secure fuel and vacuum line and linkages. 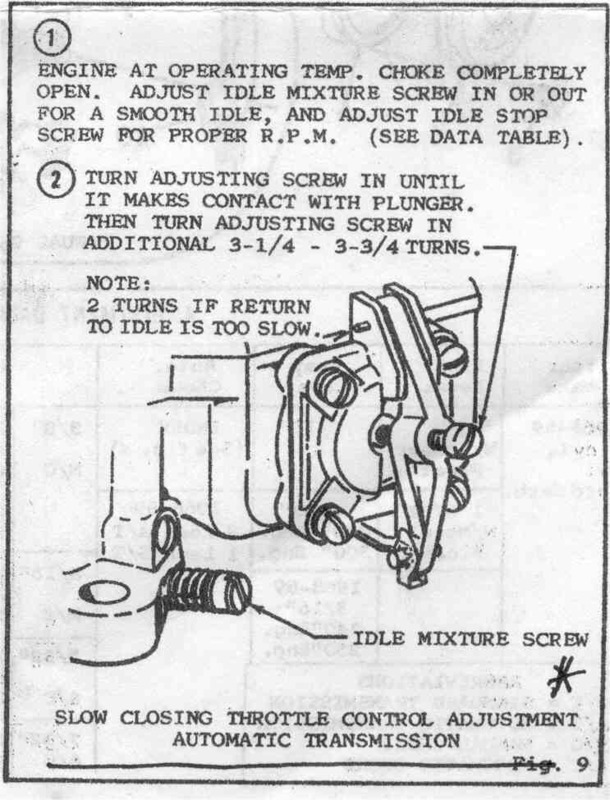 Step 36 Adjust idle to desired speed with screw X (Fig 8). 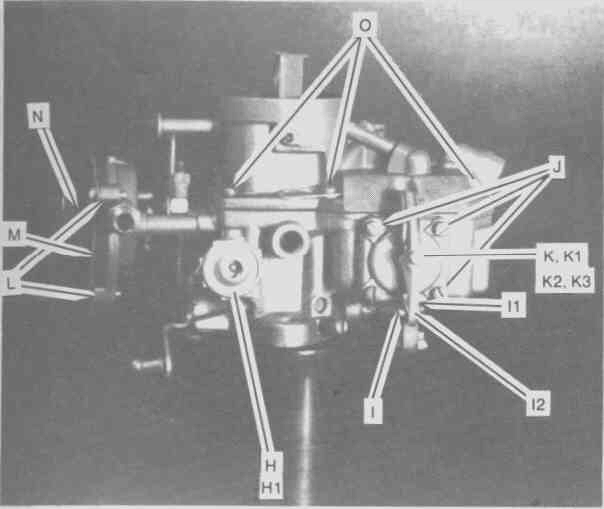 Step 37 Adjust idle mixture by turning screw U (not X in Fig 8...the OTHER one) clockwise until engine begins to run rough, then counter-clockwise until smooth idle is acheived.